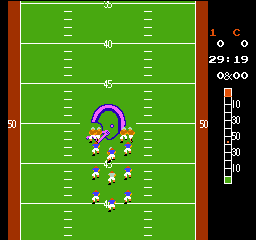 10-Yard Fight is an American Football game that's part of the NES Black Box series. It supports 1-2 players with five skill levels, but unfortunately there's no option to select your team. Formations are randomised and you never actually get to pick plays; instead, each offensive snap is preceded by a player in motion, and when he reaches your preferred spot you hike the ball. The manual claims this equates to 183 formations and 133,407 plays but that's a gross exaggeration! Even Tecmo Bowl (1989, NES) had a handful of plays, but here the lack of play-calling voids any real strategy. The gameplay has a heavy focus on passing, making the running game essentially non-existent unless the ball carrier is your quarterback. It's also very slow and waiting for a motioning player to pass by your linemen is excruciating! On top of this, there's no timeouts and the clock doesn't stop if you head out of bounds, meaning last minute drives are tough to execute. I do like the ability to shake off defenders by quickly mashing the d-pad though. Defense works okay but you can only choose one of two pre-determined players to control prior to each snap. Due to your teammates apparent inability to tackle there's times when the randomised formations dictate that both of your selectable players are on the same side of the field; if the opposing team throw a lateral to the opposite side you're screwed as there's no way to reach them before they gain a first down! Special teams wise, the kicking mechanic is decent but it's impossible to miss, and kickoffs can only reach the 30-yard line. Overall, the game is severely lacking in presentation, as there's barely any content and no halftime show as in Soccer (1987, NES). 10-Yard Fight is like many other Black Box titles in that it's a very basic interpretation of the sport, and there's not enough content to keep you playing. It has a number of fundamental gameplay issues too and it's impossible to recommend this over more accomplished games such as Tecmo Bowl and Tecmo Super Bowl (1991, NES). Random trivia: The game was first released in the Arcades in 1983.